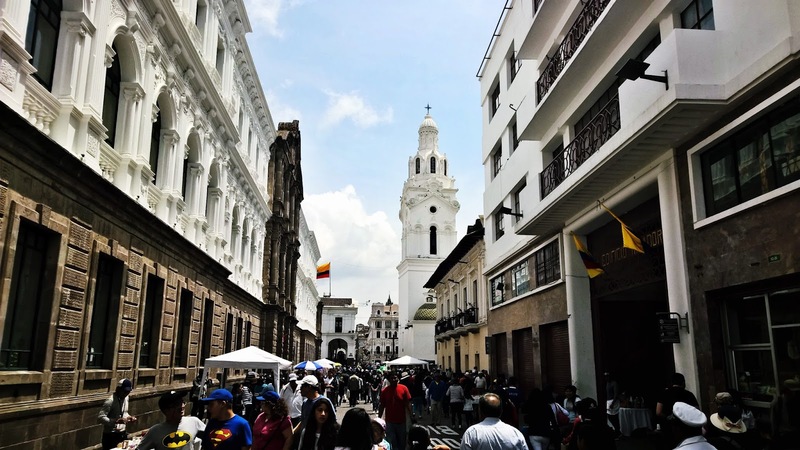 My wife and I recently did a week long trip to the South American country of Ecuador. Ecuador had been on my travel list for more than an year now, and I got to planning the trip about a couple of months back. 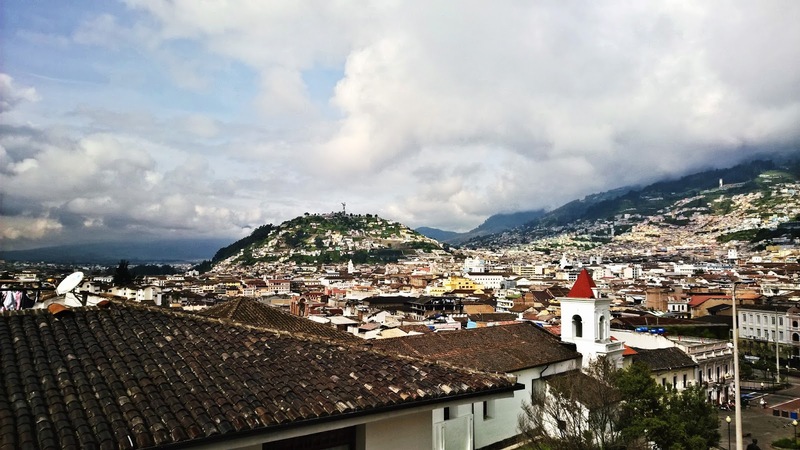 I had read about the capital Quito and the small tourist town of Baños, and that's where we ended up spending most of our time, while in Ecuador. 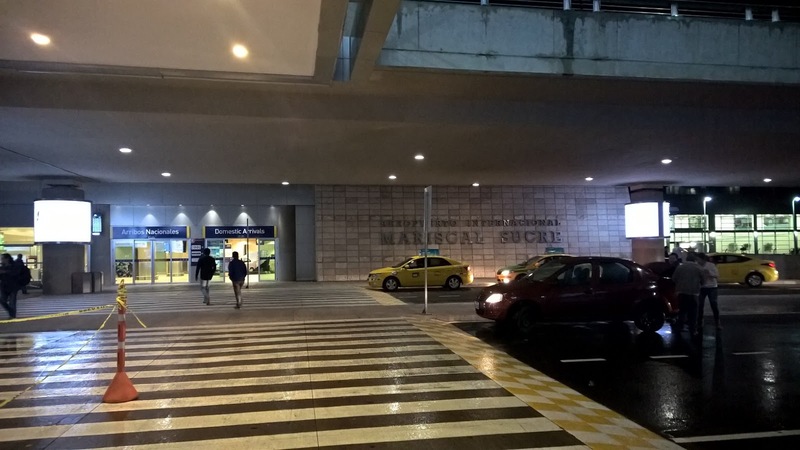 Arrival in Quito: Quito is home to the newest international airport in Latin America: The Mariscal Sucre Airport (UIO) or "Quiport", about an hour east of the old town. We landed around midnight. The immigration queue was huge, but luckily an officer directed us to step into the queue reserved for the Ecuadorian (and Colombian and Peruvian) citizens so we did the immigration (or Migracíon in Latin America) without much hassle. At immigration, we were asked some basic questions about where we lived and how long we were planning to stay in Ecuador, before stamping our passports. After stepping out of the immigration, we were picked up by our driver, who was holding up a sign with my name, whom we had pre-booked through the hotel we were staying at in Quito. We reached about an hour later and hit the bed. capital city in the world, after La Paz in Bolivia, and the first city to be listed on the UNESCO cultural and heritage sites, Quito has a feel of a small Spanish colonial town, but also has some great modern architecture which represents the post-colonial progress. The old town Quito is a nice mix of great Spanish colonial, and modern Ecuadorian architecture. You can spend 3 hours or 3 days exploring the various monuments and plazas of this wonderful city. 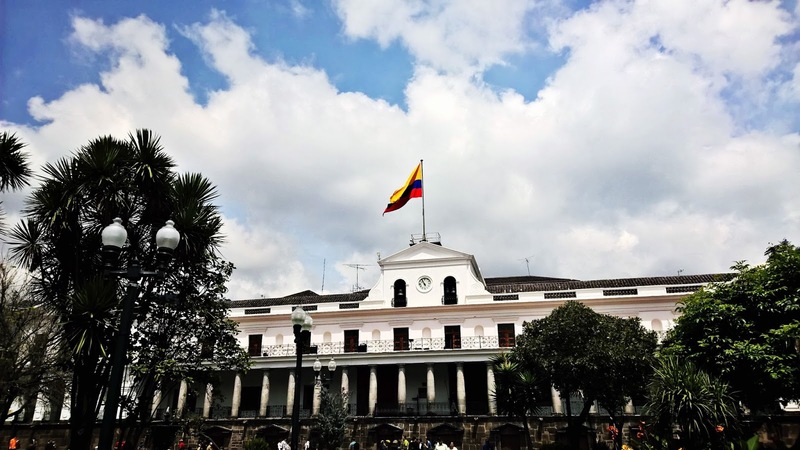 Some of the places we visited were the Campaña de Jesús church, the plaza grande where the presidential palace, Cathedral of Quito and the municipality of Quito are located. Our next stop was the San Francisco church and the corresponding plaza. We ended the tour at the near by plaza and had lunch. The Ecuadorian cuisine is a little on the blander side for my taste, and the banana is an integral ingredient in almost all dishes that they serve. After spending the afternoon to rest a little, we headed to Telefériqo which is a cable car that takes you to the top of Quito, and offers some amazingly great views of the entire city along the way. The taxi ride from the center to the Telefériqos is about $5-7 one way, and the entry fee is another $8. The oxygen levels at this height are low and you easily run out of breath. However, there're coffee shops and even "flavored Oxygen" bars at the tops to keep you breathing, if you're having issues. 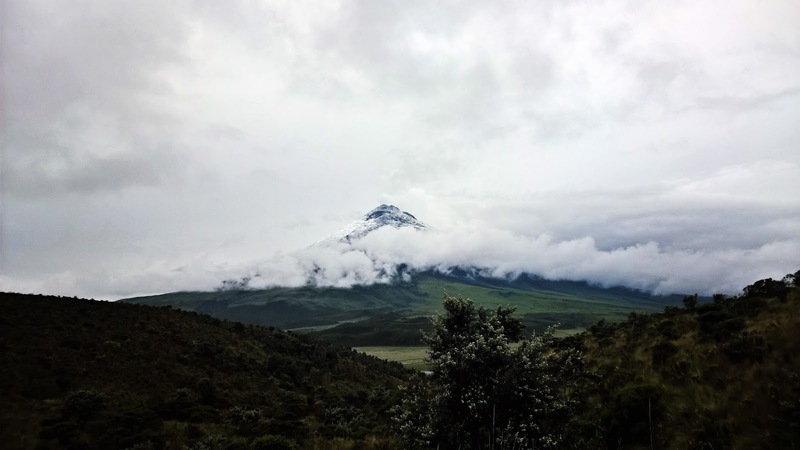 Day 2 (Cotopaxi): We had booked an early morning tour to the Cotopaxi national park, and were picked up at 6:30 a.m by the tour company shuttle. We picked up a couple of other groups on the way and were off on our way. On the way to the park, we had some delicious breakfast at one the tour company's pre-decided spots. After some eggs, jugo de naranjita (which literally mean juice of little oranges, but tastes like a cross between Sugarcane and Mosambi juice), pancake and bread, we headed off to Cotopaxi. The volcanic mountain had had some recent activity and hence we had to hike in the opposite direction to the volcano instead of to the refuge which is located at the base, which were people usually hike to in case of no activity. The hike was probably more challenging than any of the previous one's I'd done; including the Volcano Pacaya hike, back in December 2013. The hike took us through some steep but beautiful terrain of the volcanic park. We hiked for about 3 hours round trip and were exhausted when we came back to the base. The hike was followed by a little cycling along the dirt road that lead back. Exhausted, we returned on our journey back to Quito but made a stop for lunch at the same place we had had our breakfast. 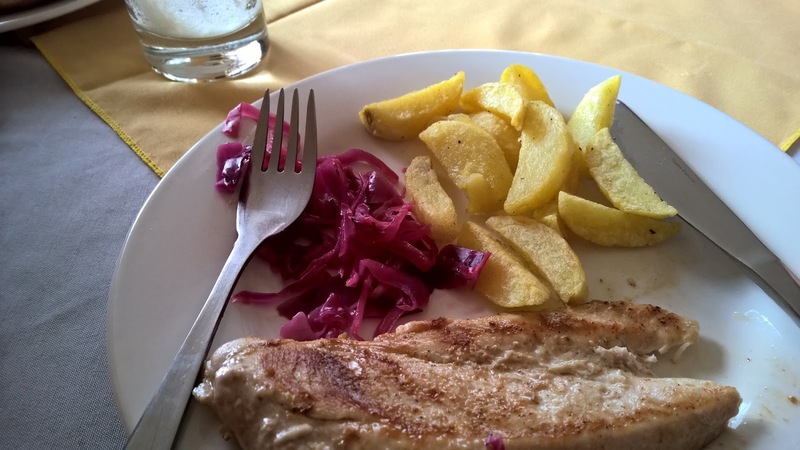 The lunch consisted of potato soup as a starter, followed by grilled chicken with purple cabbage and chips on the side, and ended with a sweet dish make out of bananas. We reached Quito at around 5 pm and rested a little, before going out for dinner. as the bus made some small stops to pick people up along the way. From the terminal in Baños, we took a $1.50 taxi to get to our hotel, La Casa Verde, which was about 5 minutes. 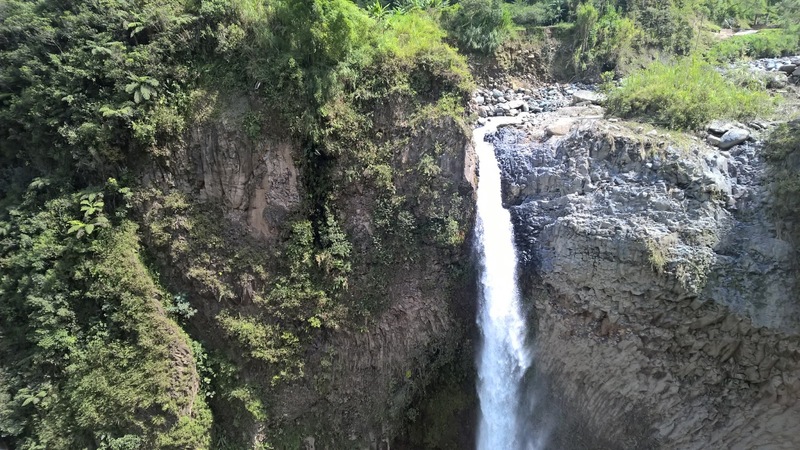 After our arrival, we were shown around the hotel by the receptionist (who spoke only Spanish), after which we freshened up a little and had him arrange a taxi to the Ruta de las casacadas (Waterfall route). The route goes through two or three waterfalls, viz. 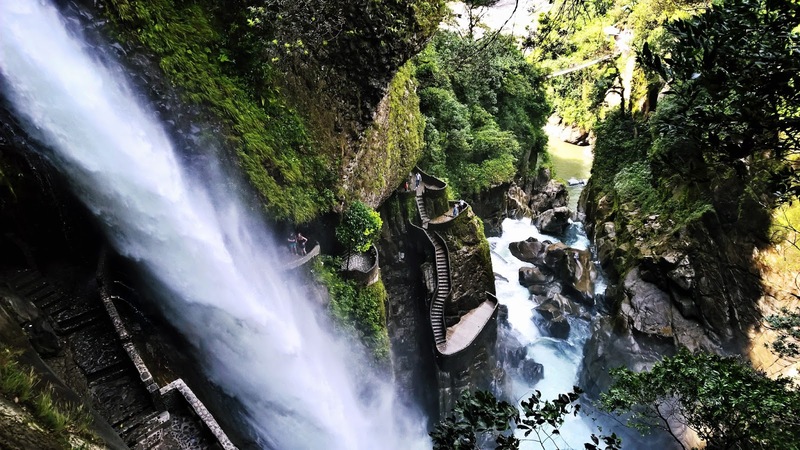 Cascada de Agoyán, Manto de la Novia (Bride's Veil), where you can take a gondola ride across the gorge, with beautiful views in all directions. amazing. Owing to the fact that the whole area is somewhat humid but in a pleasant way, you might get drenched. There are two routes to get there a longer one that takes you behind the waterfall, and a shorter one that takes you above the waterfall, but you can still walk to the waterfall. Dugout canoe ride inside the Amazon! Day 4 (Puyo, Amazonas): We had pre-booked a day in the Amazon rainforest, with a local guide, Oswaldo, through our hotel in Baños. We were picked up at 8:30 a.m, were off to Puyo, which is known as the "Gateway to Amazon", and is the last real town before you hit the dense rain forest. 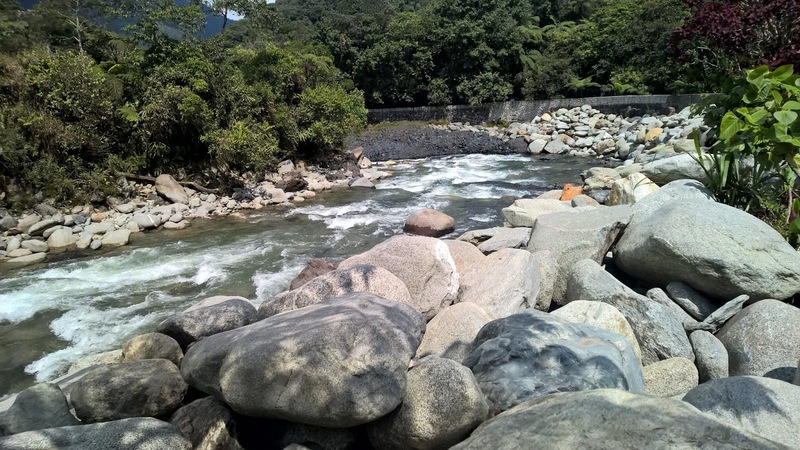 On our way, Oswaldo explained how the modern tunnels have eased the travel between for the indigenous people, and have led to a betterment in their quality of life, since having access to Baños town. On the flip side, the tunnel construction has caused a negative impact on the mountains and the environment. tiny towns like Shell, named after the oil company, who did some digging here back in the day. Petroleum is an important export for Ecuador, but a dip in the oil prices have had a negative impact on the country's economy and an increase in local taxes. After a few minutes we stopped by a place which had some of the biggest fish I've seen. The above video shows our guide feeding them little fish nuggets. Fortunately, these giants don't have teeth, hence they do not pose any threat to humans. 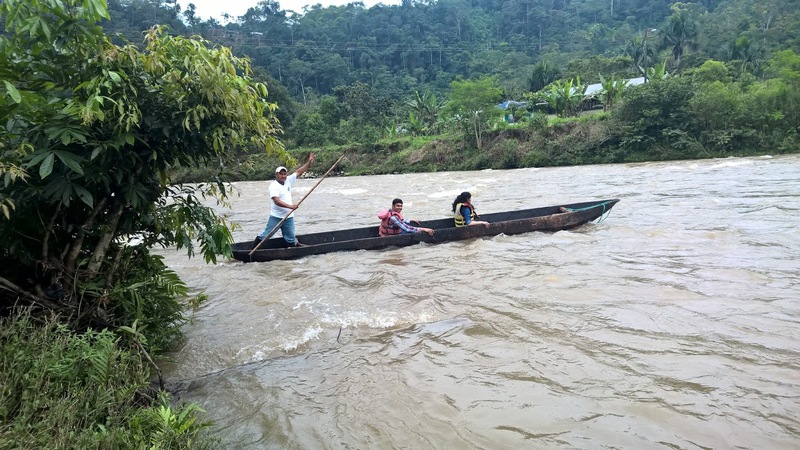 Next, we stopped for dugout canoe ride in the river Puyo, inside the Amazon! The half an hour ride with the river's current was a wonderful, memorable experience. Maeto: Lunch in the Amazon! We finally headed to the dense forest, where Oswaldo gave us gumboots (botas in Spanish), for our forest hike. 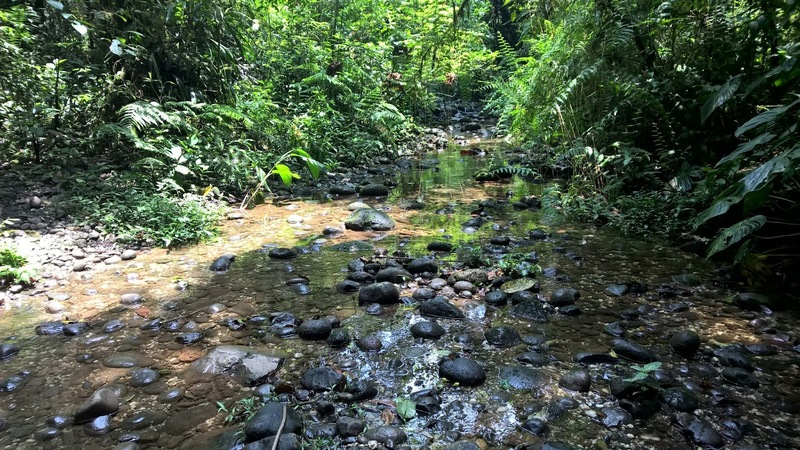 We hiked inside the forest for about an hour, through streams, dense forest and mushy lands. It was a never before experienced, thrilling experience! 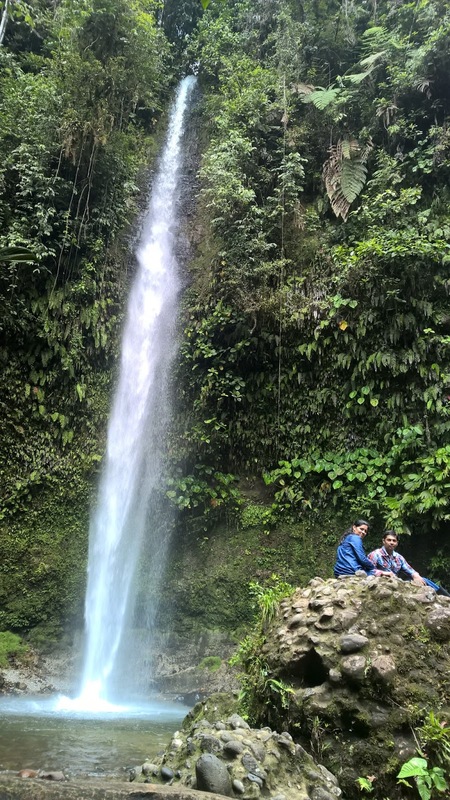 We finally reached our destination the hola vida waterfall. After spending about half an hour at the fall, we returned on our way back to the refuge, and then heading on our way to lunch at a local lady's restaurant. 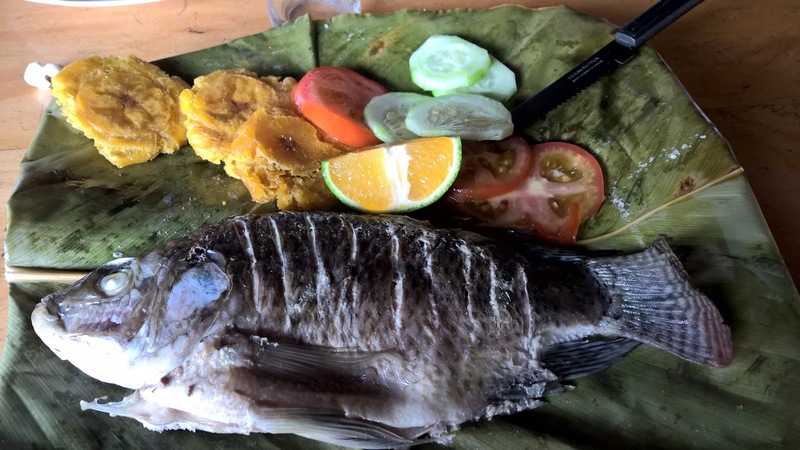 The lunch was Tilapia, baked in banana leaf with a little salt added to taste, along with banana cakes and salad on the side. The Tilapia flavors come from the banana leaf and there is aren't any other spices added. After lunch, we relaxed for a little bit and headed back to Baños, but stopped by at an indigenous village for short time. The village people here lead a simple lifestyle, making some pottery and handicrafts for a living. Their staple food, is plantains and other fruits that are easily obtained near by. After sometime we headed back, picking up dinner on the way, since we were too tired to head back out after the day we had had. By the time we reached the hotel, it was 6 in the evening. 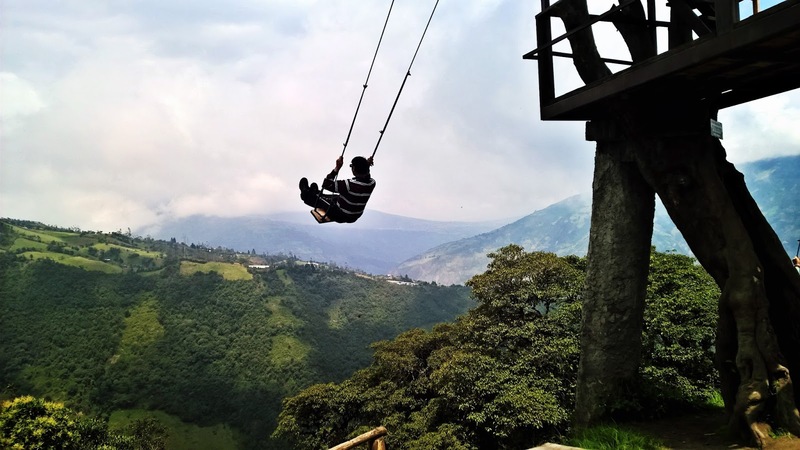 Day 5 (La casa del arbol, Baños): Before heading back to Quito, we had our taxi driver take us to La casa del arbol (Tree house), which is famous for it's swing. La Casa del Arbol is simply a small house built in a tree used for observing Mt. 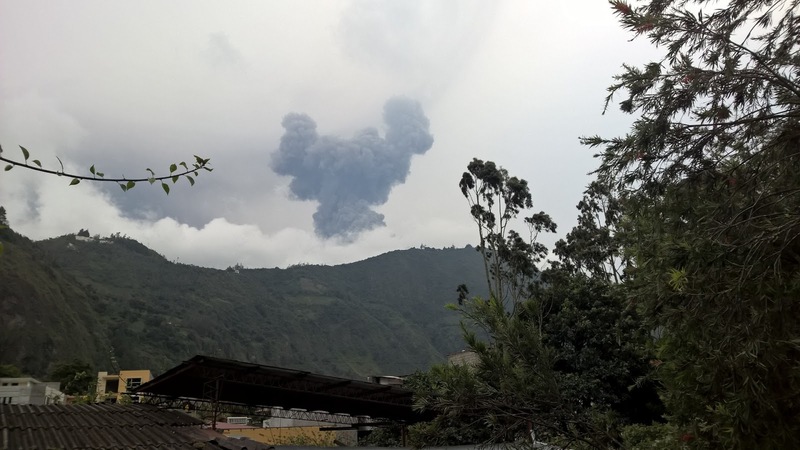 Tungurahua, the active volcano in the near distance. The crude swing hanging from one of the tree's branches has no harness, net, or any other safety feature. Adventurous visitors are welcome to take a ride on the swinging seat, with nothing but a fabric belt to hold you in place. The actual swing is not over a cliff, but over a steep hill. After our little adventure, we took the taxi back to Quito along the scenic mountainous terrain, stopping on the way for some lunch and sugarcane juice (yum!). 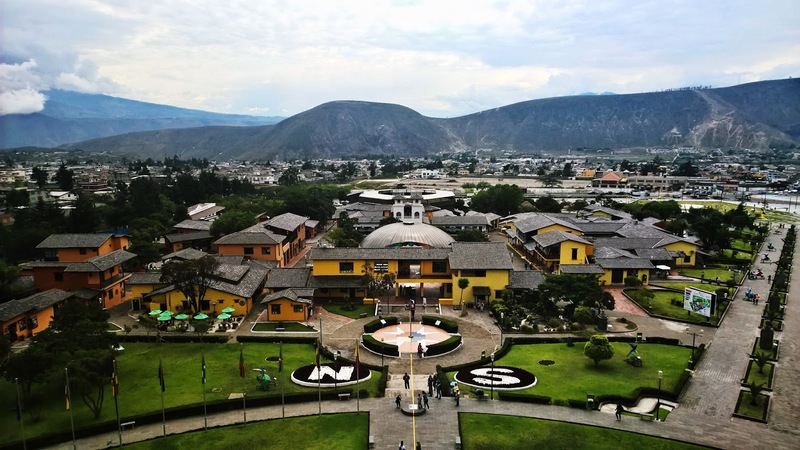 Day 6 (La Mitad del mundo, Quito): The name "Ecuador" is actually Spanish for the word Equator, and that's exactly where we headed on our last day in the wonderful country. The city named "Mitad del Mundo" or the "Middle of the world", is about a 30 minute taxi ride away from Old Quito. The equatorial monument has been built here by the government of Ecuador to signify the exact location of the Equator. Although, the GPS claims the location is a few feet away. In reality the Equator is a 5 km line that goes through the middle of the earth. 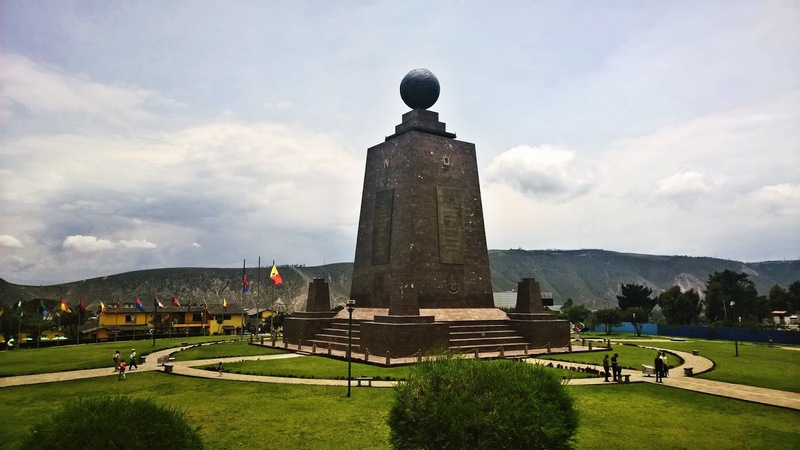 The monument may not be the actual equatorial line, but the it's an important tourist attraction, generating a large yearly revenue for the government. The entry fee is $7.50 and it gets you access inside the park, the museum (which is inside the monument) and the planetarium. Inside the museum you can view various facts and experiments about the physics of beings at the equator and about the earth's axes in general. The monument is also surrounded by restaurants, which gives it a little commercial feel. The UNASUR (Union of South American Nations) headquarters is located just next to the monument. There're also several art museums honoring the French expedition that came here to learn about the equator. This brought to an end a wonderful week, in the most geographically diverse country I've been to. It's hard to believe that after spending about a week in the country, which is smaller than Kansas, we'd only explored about one-fourth of the attractions. I urge you explore this beautiful country, including the Galapagos islands, if you have time. It really is a life changing experience! 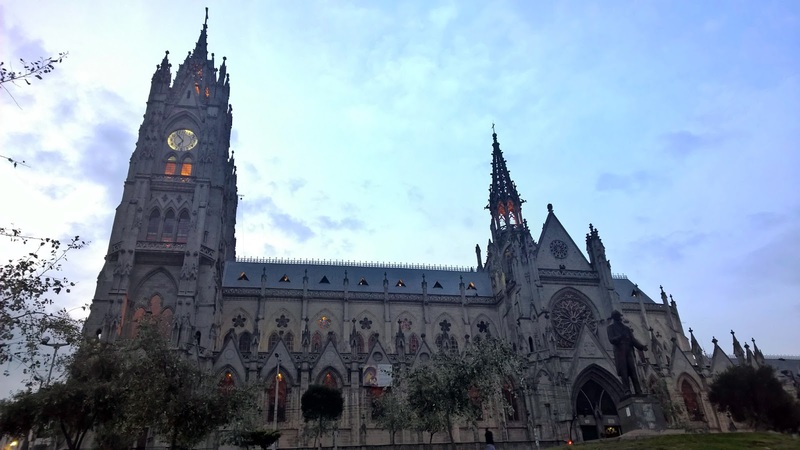 Tours: Quito free walking tour ($50 private tour), CarpeDM adventures for Cotopaxi tour and Oswaldo, a private guide hired through La Casa Verde for the Amazon jungle day trip.